Scrambling out of a downed, waterlogged airplane, swimming to shore through an icy cold lake, spending the night exposed in the freezing, desert chill, then walking away with little more than bumps and bruises and the urgent need of a nice, warm bed. 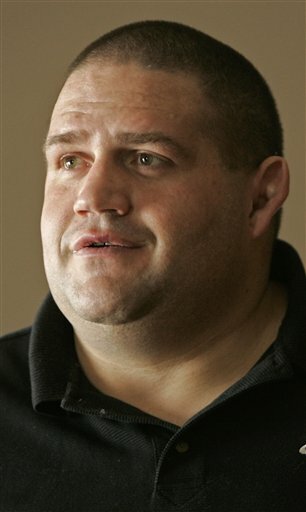 Harrowing close calls are becoming a habit for Rulon Gardner, Olympic wrestling champion-turned-escape artist. There was the time he lost a toe to frostbite after being stranded in the wilderness. He also was involved in a serious motorcycle accident and way back in third grade, he impaled himself with an arrow. Now this. Gardner's weekend brush with death was the third since he unbelievably captured the gold at the Sydney Olympics in 2000. It happened when a small airplane he was riding in crashed into the aptly named Good Hope Bay, near the Arizona-Utah border. "I should be dead," Gardner told The Associated Press on Monday. "I shouldn't be on the earth today." Gardner and the two other men in the plane, brothers Randy and Leslie Brooks, swam to shore through the 44-degree water and spent Saturday night on the banks without shelter. On Sunday morning, they spotted a fisherman, chased him down and got a ride back to safety. None of the men were left with major injuries. The 35-year-old Gardner said his hip hurt and he believed he might have sustained a concussion when the plane hit the water. But he never lost consciousness. If he had, he might have drowned. "I don't know where to put it," he said when asked to compare this to his other near escapes. "It was pretty intense." Hypothermia often sets in and many people wouldn't be expected to live through an hourlong swim in cold water, said Steven Luckesen, a district ranger at Glen Canyon National Recreation Area. "If these guys were a cat with nine lives, they just used up three of them," Luckesen said. How many lives could Gardner possibly have left? Five years ago, he was snowmobiling in Wyoming when he became separated from a friend while trying to pass over a ridge in deep snow. As he struggled to find his way back, he fell into an icy river several times. He wound up stranded overnight. His body temperature fell to 88 degrees. He saved himself that time by finding a cluster of trees and digging into the snow to wait the night out. He contorted himself into strange positions, trying not to let himself fall asleep, afraid that if he did, he would freeze to death. He lost a toe to frostbite after that close call, but still made it back to the Athens Olympics, where he won a bronze medal and left his shoes on the mat _ the symbolic gesture in wrestling that signals retirement. Shortly before his final Olympics, Gardner was struck by an automobile while riding a motorcycle to practice. That time, he walked away with only abrasions and a sore left heel. When he was a kid, he punctured his abdomen while playing with a bow and arrow while his parents were out of town. The doctor said Gardner had just missed puncturing a vital organ. "Every day, we all have situations," Gardner said. "Some people handle them in different ways. I guess that's either a gift, or something I go through that most people say, `that's crazy.'" On his latest near-death experience, Gardner and his friends were in a Cirrus SR 22, flying above Lake Powell. The trip was to see Randy Brooks' houseboat from the air, but the small plane was flying low, and it suddenly dipped and began clipping the surface of the water. It stopped on the lake and began sinking. "I was saying, `This can't be happening right now,'" Gardner said. He said the crash itself wasn't traumatic. "The trauma was hitting the water and realizing you're a heck of a long ways away from that beach," Gardner said. "How are you going to get there?" He grabbed his coat from the plane before they swam away. He remembered how cold he'd been after the snowmobile incdent in 2002. But the Brooks brothers told him to drop everything _ "either your stuff or your life," Gardner recalled them saying. The Olympic athlete is not a good swimmer, and his friends gave him a quick lesson in doing the backstroke. Gardner said the water temperature didn't faze him; he thought he'd survived the worst by living through the crash. But Luckesen said hypothermia starts setting in with most people after about 30 minutes in waters that cold. "It is truly amazing that they were able to swim through Good Hope Bay and then spend the night without any shelter," said Kevin Schneider, a spokesman at Glen Canyon. Once at shore, the men took off their clothes in hopes of drying them out before the sun set. They would have been happy for some boater to see them standing naked on the shore, but it was too late in the day _ no such luck. Knowing they'd have to spend the night exposed in the 30-degree weather, they built a two-foot-high rock wall as a shelter from the wind. They huddled through the night to keep warm, alternating turns taking the brunt of the cold wind. They were saved in the morning when they saw the fisherman. Still feeling the effects of his latest accident, Gardner stayed on schedule Monday, boarding another airplane _ this one to Boston for a previously scheduled speaking engagement. He is working toward getting his pilot's license and said the weekend's events won't change that. "I think I'm going to get it," he said. "Just go out there and enjoy it." Nor will the close calls and brushes with death sap his love for nature, even when the conditions are less than ideal. "Growing up in Wyoming, we're used to the cold _ usually not that cold," he said. Maybe strangest of all is that Gardner would be a household name even without all the drama. At the Sydney Olympics, he pulled off one of the biggest upsets in the history of the games when he won the gold medal in Greco-Roman wrestling by ending Alexander Karelin's 13-year international winning streak. They called it "The Miracle on the Mat." Turns out, it was the first miracle of many. AP Sports Writer Doug Alden in Salt Lake City contributed to this report.